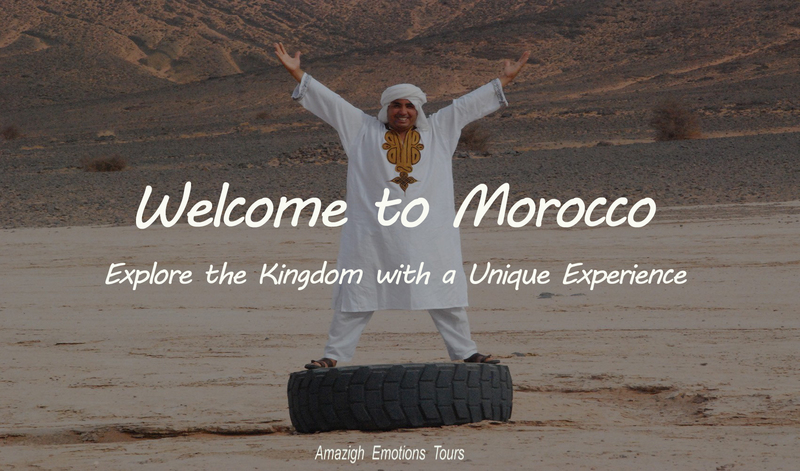 Day 1: Agadir - Taroudant - Ouarzazate (370 km): Early start at 08 am we begin to browse our trip from the city of Agadir to Ouarzazate (Hollywood Africain). We visit the medina of Taroudant (The small Marrakech) with its old walls and souks, then continue to Taliouine (The capital of saffron) where we have lunch near the old kasbah of Glaoui. Afternoon, we go through Tazenakht known with its traditional carpet weaving to reach the famous village Ait Ben Haddou declared World Heritage Site by Unesco. 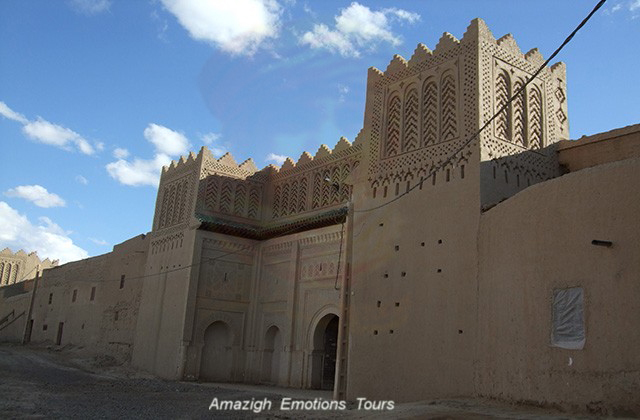 After we will make a photo stop at the cinema center and the Kasbah Taourirt (former Ouarzazate). Overnight at Hotel/Riad. 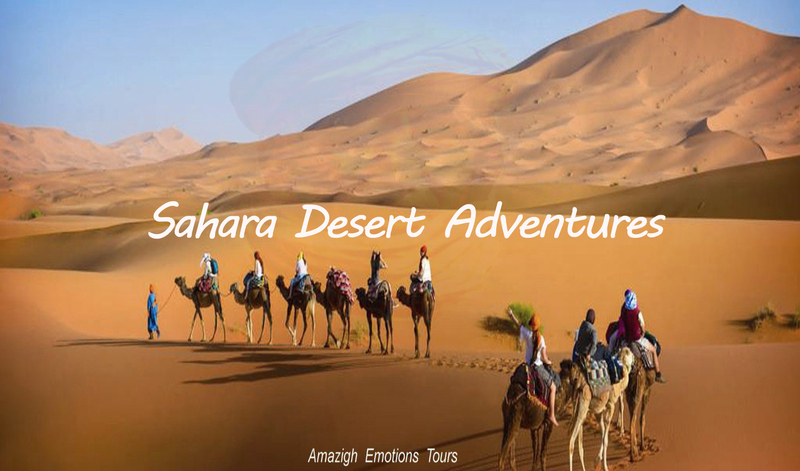 Day 2: Ouarzazate - Boumalne Dades - Tinghir - Merzouga (380 km): In the morning after breakfast, we head to the desert of Erg Chebbi by the road of thousand kasbah by the fascinating valley of Roses Kalaat M'Gouna, Dades and Todra, then lunch break. 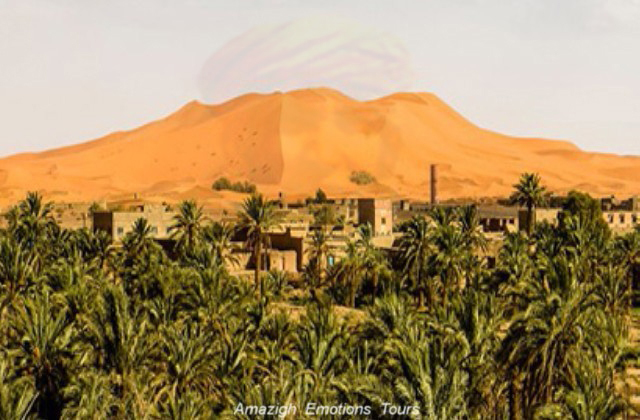 After continuation to Erfoud to visit its famous marble deposits and fossils, then Rissani (the birthplace of the Alawite dynasty) to finally arrive at the feet of golden Merzouga dunes in the late evening. Here you can choose to sleep in a Kasbah/Hotel, where under nomad tents in a private bivouac in the desert by camel riding. Day 3: Merzouga - Rissani - Nkoub - Zagora (320 km): After breakfast, departure to the impressive Draa Valley in Zagora (old caravans start to Timbuktu 52 days) via a small town of Rissani, Alnif, Tazzarine and the fortified village of Nkoub where you will have lunch enjoying a beautiful view of the oasis and kasbahs. 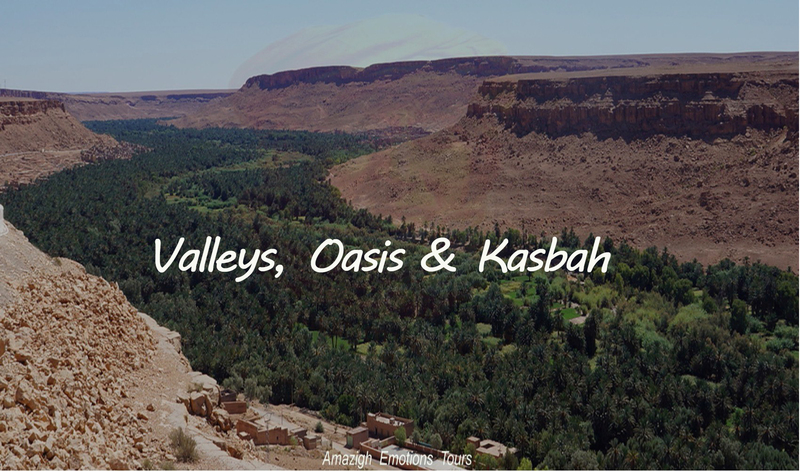 Afternoon, we go down with a series of pre-Saharan palms and ksour of the valley Draa (the largest Moroccan river and the largest oasis in the world). Overnight at Hotel/Kasbah where in the desert camp. Day 4: Zagora - Foum Zguid - Tata - Igherm (350 km): After breakfast, we go to the direction of Tafraoute by a direct route and parallel with the Algerian border. 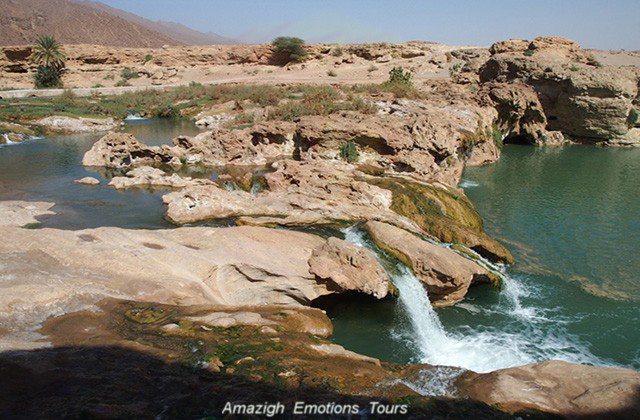 We will pass on the fortified town of Foum Zguid and the visit of small waterfalls of Tissint to achieve the great oasis of Tata and lunch. After we continue with the foothills of the Anti-Atlas where small oases and Berber villages are surrounded by a good landscape Saharan mountains. 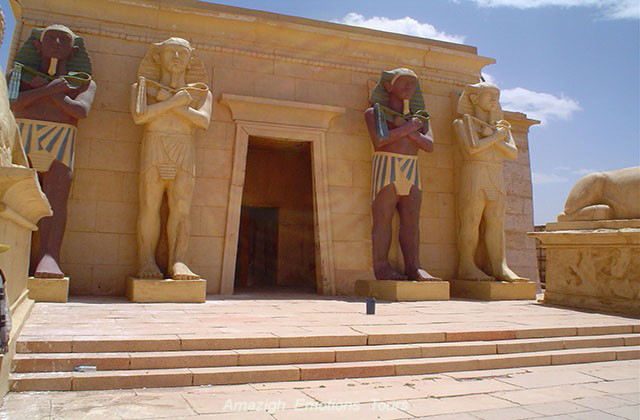 Arrive to Igherm expected in late evening and overnight in a local Hotel/Riad. Day 5: Igherm - Tafraoute - Tiznit - Agadir (310 km): The last leg of our tour will start after breakfast. 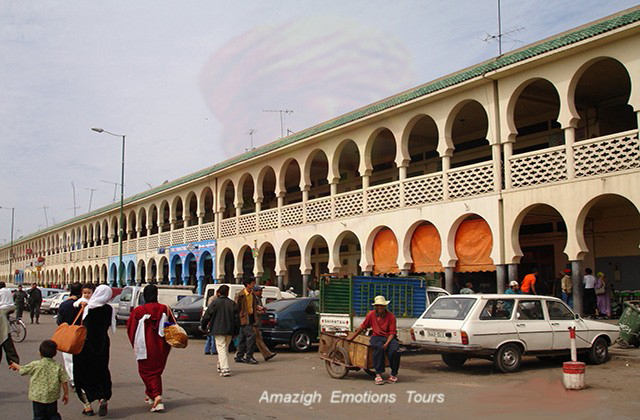 We head to Agadir on the Atlantic coast through the mountains of the Anti Atlas with argan trees and Berber villages ... We go on the small town of Tafraoute surrounded by tall white blocks of granite mountains, red, pink ... We will visit the rocks pints and continuing to Tiznit and lunch. 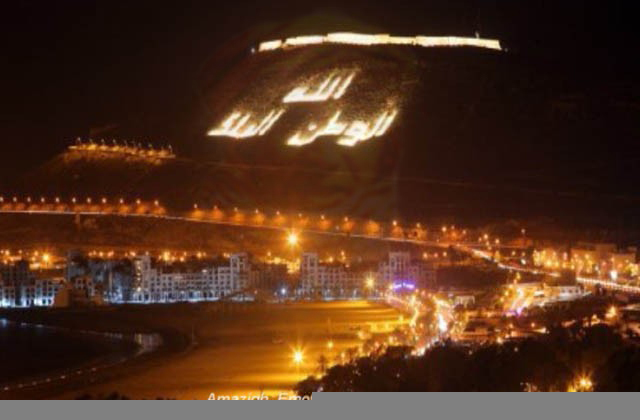 After we visit the beach of Aglou and then through the natural reserve of Sous Massa to reach Agadir in late evening and the end of our journey. 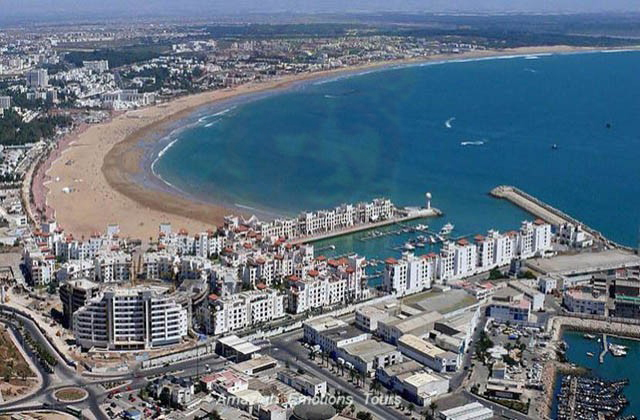 Day 1: Agadir - Tamanar - Essaouira (170 km): Early departure to Essaouira (The Ex-Mogador) by the coastal road passing on small Berber villages at the seaside and in areas of argan trees. 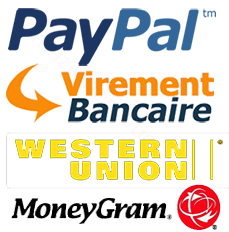 We will visit the beach of Sidi Kaouki, then continue to reach Essaouia around noon and lunch. 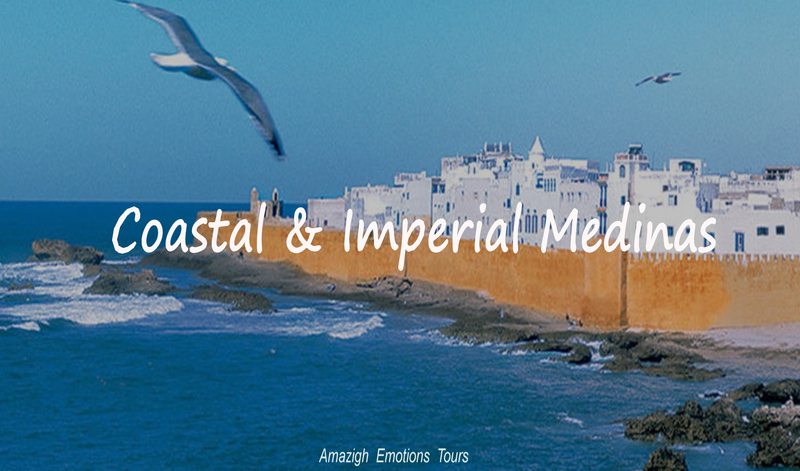 After you install in your accommodation, you will have the evening free to walk in the medina this old Portuguese fort, between his former streets and walls, souk, the port and the Skala with magnificent views to infinity on ocean ... Overnight in the Hotel/Riad. Day 2: Essaouira - Chichaoua - Marrekech (190 km): After breakfast, we head to the atmosphere of Jama el Fna square in Marrakech. We cross a large forest of argan trees and small villages to get to Marrakech, the red city, the pearl of the south or the bahja ... After lunch, we will install into your accommodation, then you will have time to visit important sites such as the Majorelle garden, the Bahia palace, the Saadian tombs and the medina with its souks ... And attending a wonderful sunset from the terrace of a coffee (Marrakech by night) ... Overnight in Riad/Hotel. Day 3: Marrakech - Ait Ben Haddou - Ouarzazate (320 km): In the morning, we are preparing our departure from Marrakech to the south. 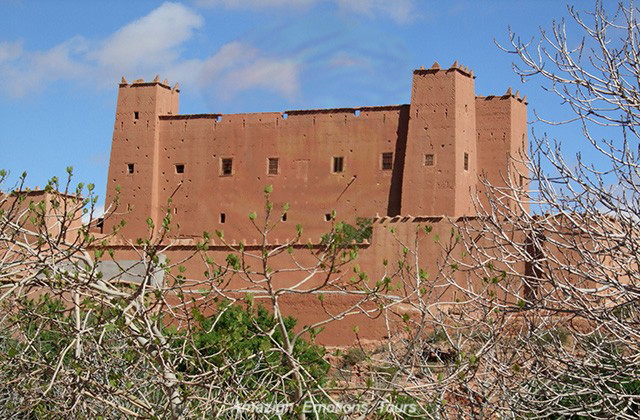 We drive through the High Atlas, passing over beautiful valleys and Berber villages via Tizi n'Tichka (2260m) to reach the ruined Kasbah Telouet (Old house of the Pasha Glaoui). After to the picturesque Ksar Ait Ben Haddou along the Ounilla valley and lunch. 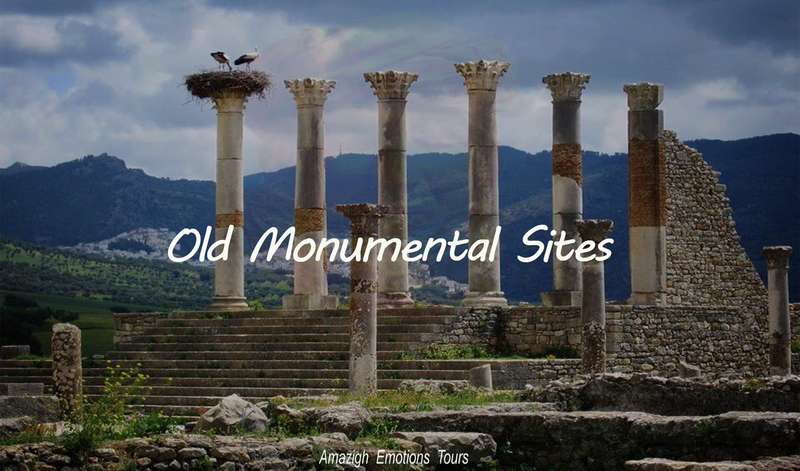 It's declared by Unesco as world heritage and it was an important step for caravans. 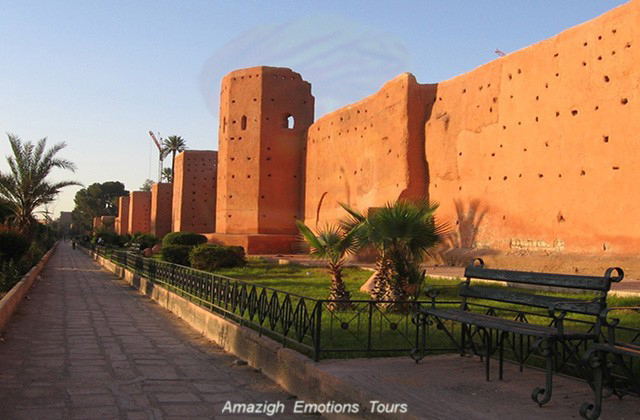 After, visit the studios center and Taourirt Kasbah. Overnight at Riad/Hotel. Day 4: Ouarzazate - Taliouine - Taroudant (280 km): After breakfast, we depart to Taroudant nicknamed small Marrakech, it was also the capital of the Saadian dynasty. 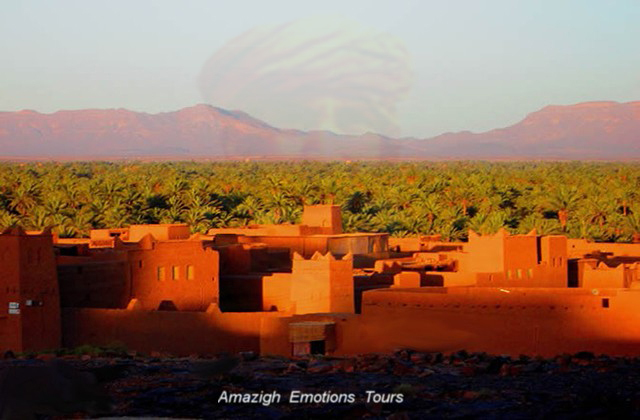 We will pass the famous town of Tazenakht known with its carpet weaving, then we come to Taliouine (the city of saffron) and lunch in front of an old Kasbah of Pacha Glaoui. 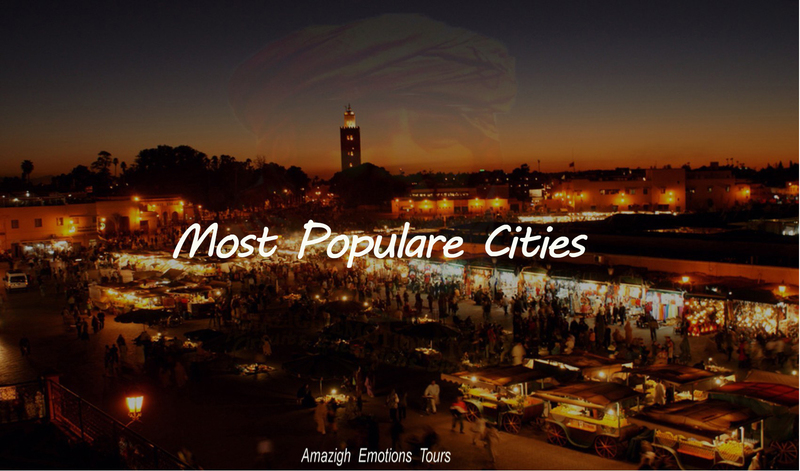 Afternoon we reach Taroudant, you will have time after you settle into your accommodation to visit the monuments of this old city. Diner and overnight in a Riad/Hotel. Day 5: Taroudant - Tafraoute - Tiznit - Agadir (310 km): The last day of our travel will start after breakfast. 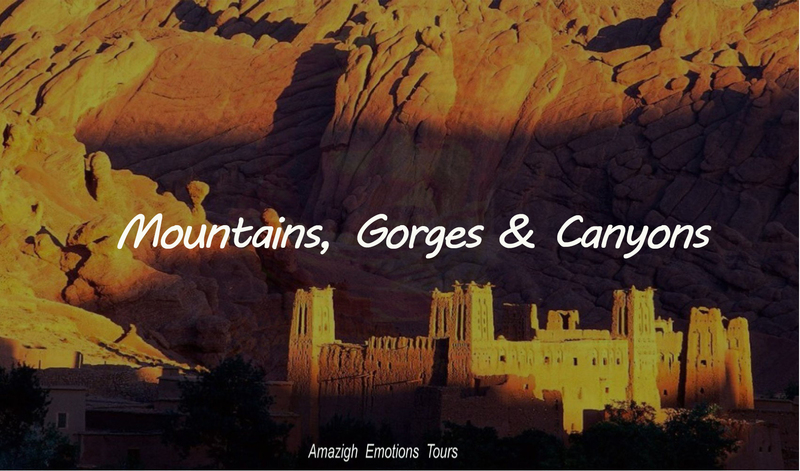 We head to Agadir crossing the Anti-Atlas mountains with a Berber villages and argan trees ... We visit the small town of Tafraoute surrounded by tall mountains of blocks of granite (white, red, pink ... ) and visit the pints rocks, then on to Tiznit city and lunch. After visit the beach of Aglou and then through the nature reserve of Sous Massa to reach Agadir end day and end of our trip.